The NHS Five Year Forward View states that a ‘radical upgrade’ in prevention and public health is required to avoid spending billions of pounds in the future on avoidable illness. We all know that the NHS is facing a significant gap in funding and pressures on services continue to build. There is a growing consensus that prevention must be part of the solution. This involves not just doing ‘more prevention’ but doing it differently as well, by investing jointly across the health, public health and social care system. The last two blogs in this series have argued that, in general, public health activity is cost-effective and that we must consider increasing investment in prevention now in order to save money and improve the health of the population in the future. This final blog supports the economic case for public health by showing how the benefits from public health can affect many different parts of the health and social care system (as well as to employers and other state sectors such as criminal justice and education). Public health is the poster child for system-wide benefits. And it’s essential that we take this broader view if we’re going to make the right resource allocation decisions. For example, tackling alcohol-related violence and other harm may well involve intervening in the health system, but will result in significant benefits to the criminal justice system. And reducing falls in older people will involve costs and benefits for different parts of the social care system. Often more than one sector of society benefits from investing in public health interventions. It’s vital that we open up the debate on investment in prevention and take it to the wider public and key audiences that are likely to be receptive to our case. Employers, for instance, are surely major allies as we highlight evidence of productivity benefits from numerous public health interventions (from smoking cessation to promoting good mental health). But there are other important partners to consider as we make our economic case: for example other government departments in areas such as transport and education. We may make the biggest long-term impact on obesity by promoting active travel and radically changing our physical environment. The economic case should be presented in a way that takes all these areas that may seem disparate, but are in fact connected, into account. With many public health interventions now commissioned by local authorities, these initiatives should be regarded as an investment in the social and economic well-being of a local community. And several local authorities across the country are already adopting this approach. One example is Blackburn with Darwen Borough Council, which is working to become a public health council – as opposed to a council with a public health service. Their £1 million Social Determinants of Health Fund is distributed across all council departments, which in turn commit to delivering specific health outcomes. These range from addressing child poverty and increasing use of parks and open spaces, to providing fall prevention services and enforcing under-age drinking laws. There is a clear understanding at the council, and at many others, that health outcomes apply to a range of different areas – from policing to transport and housing. Public health professionals need to work with stakeholders that traditionally sit outside the health arena in order to help make the case for increased investment in prevention and early intervention. Many of the tools that PHE is currently developing or commissioning have precisely that aim of helping local systems to make the business case for investment in prevention, drawing upon the best available cost-effectiveness evidence. So what are the key recommendations to help make the case for investment in prevention? Working closely with NHS partners, there is every opportunity to develop a genuinely long-term approach to the economics of prevention. As stated in the introductory blog in this series, this represents a long overdue and once-in-a-lifetime opportunity. It will probably not come again. 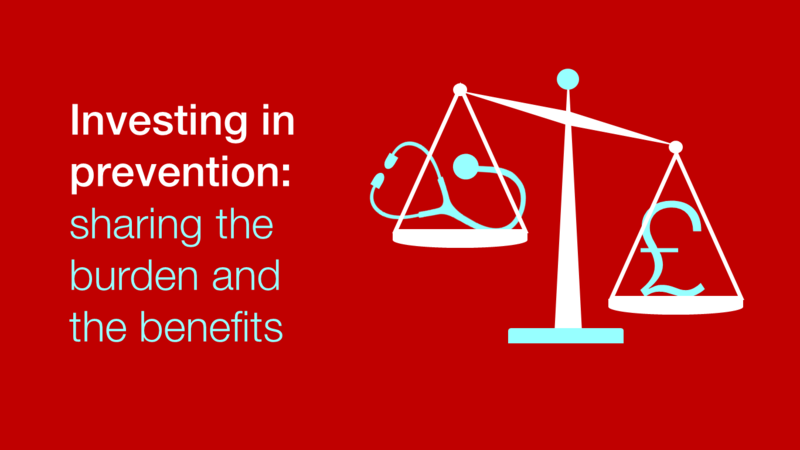 Part 2: Investing in prevention: is it cost-effective?